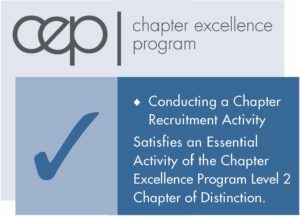 The key to a successful chapter is the ability to recruit and retain members. Recruitment is an ongoing process and should involve as many current members as possible. If you are starting a new chapter, then all it takes is a few interested students to help get the momentum going. When members and advisors focus on the goal of ensuring that every eligible student has the opportunity to be involved in SkillsUSA, it makes recruitment easy. The heavy lifting has already been done for you. Check out the top 10 recruitment ideas that are tried and true from experienced SkillsUSA advisors, found in the Membership Recruitment Ideas document. Have students take the lead by personalizing the Meeting Promotional Fliers with information specific to your chapter and then hanging the fliers around the school. Encourage students to talk with other students and teachers about the benefits of SkillsUSA as they travel around the campus. Using the posters from the Membership Kit, create a bulletin board in a prominent location in the school. Get a few of your members involved. They will have an incredible time working together and create something that will have an impact on membership recruitment. Incorporate the SkillsUSA theme for the 2018-2019 year into your recruitment activities: SkillsUSA: Champions at Work, Career-Ready Starts Here. Using SkillsUSA’s new Brand Center will guarantee that you create a strong visual identity within the school. The interactive website makes it easy for members to download existing SkillsUSA logos (national, state and slogan art) as well as the SkillsUSA Framework art. An all-new function allows local members to create their own personalized SkillsUSA logo with the name of the chapter. Members will be asked to register when first visiting the site, which enables them to save specific sections as favorites. This will be a unique login and password and is not tied to our registration system. Learn more at: www.skillsusabrandcenter.org. Capture students’ attention with the Kickoff Video and Student Message by Executive Director Tim Lawrence. Post these on social media or your campus website. Seek creative ways to get the word out about SkillsUSA. Hold a membership recruitment drive. Create incentives for students to join, including door prizes, drawings and special snacks. It is amazing what motivates students, so consider putting together a committee to organize and run the membership recruitment drive. Their ingenuity and excitement for SkillsUSA will quickly spread. Use the SkillsUSA PowerPoint during class to introduce students to the organization or during an open house when parents are present. If possible, have parents and students seated and present the PowerPoint to them. An extra bonus is to have SkillsUSA members present selected slides or give short testimonials on why they benefit from being involved in SkillsUSA. For additional ideas, check out the Ideas for Using the SkillsUSA PowerPoint. Ultimately, membership recruitment is an opportunity to showcase your CTE program to the school and community. Don’t miss the opportunity! Have questions? Need answers? The SkillsUSA Membership Hotline can take care of all of your chapter questions. From how to start a new chapter to ways to strengthen your chapter, the hotline operators are standing by. If you have questions or need assistance with online membership registration, the hotline operators can take care of that, too.